1. 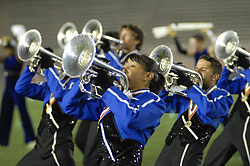 Blue Devils come up smelling roses in Pasadena Aug. 11, 2007: The Blue Devils completed their three-day sweep of the 2007 Drum Corps International World Championships Saturday night, winning the final show of the season in impressive fashion with a 98.000 and sweeping the Brass, Percussion, Ensemble Visual and General Effect caption awards. Read the article. 2. Recap Analysis: Division I World Championship Finals Aug. 12, 2007After surviving a winning spread in Semifinals that was a scant .05 over the competition, Blue Devils (1st-98.000) blew it open to .975 over the Cadets while earning the corps' 12th Drum Corps International Division I World Championship. Read the article. 3. Putting it on 'the line': Cadets' two point penalty withdrawn Aug. 10, 2007: Brief controversy was sparked during the 2007 Drum Corps International World Championship Quarterfinals on Aug. 9, when director George Hopkins, concerned for the safety of his corps performers, indicated that the hash marks were not visible on the field prior to his corps' performance. 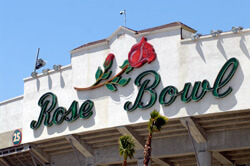 A 15 minute delay followed until the lines were repainted at Rose Bowl Stadium. Read the article. 4. 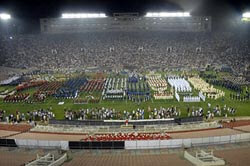 Video: Division I World Championship week in review Aug. 12, 2007: Video recap of Division I action during the 2007 Drum Corps International World Championships at Rose Bowl Stadium in Pasadena, Calif. Watch the video. 5. 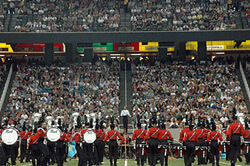 2007 Drum Corps International audience milestones Sept. 13, 2007: Drum Corps International today announced audience milestones for the 2007 Summer Music Games Tour, capping the organization's 35th anniversary season. With the highest attendance figures recorded since the early 1990s, the '07 World Championships highlighted one of DCI's most competitive seasons ever. Read the article.